Steak, wings, ribs, and more! (SPOT.ph) This will be a meaty week! Well, meaty, sweet, and carbo-loaded. We found two steak deals, one wing promo, one ribs steal, three pasta offers, and two dessert discounts. 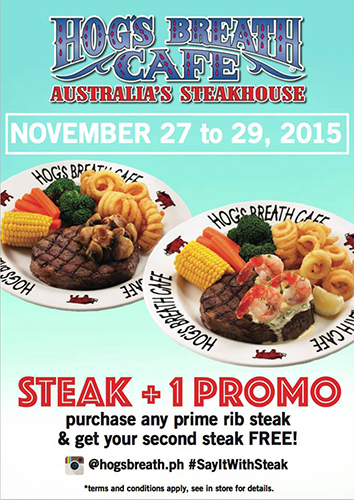 Up to November 29, every order the Prime Rib Steak at Hog's Breath Cafe will be served with a free 200-gram helping of more prime rib. Hog's Breath Cafe is at Civic Drive River Park, Festival Mall, Filinvest City, Muntinlupa City. Thanksgiving lasts one week at House of Wagyu. 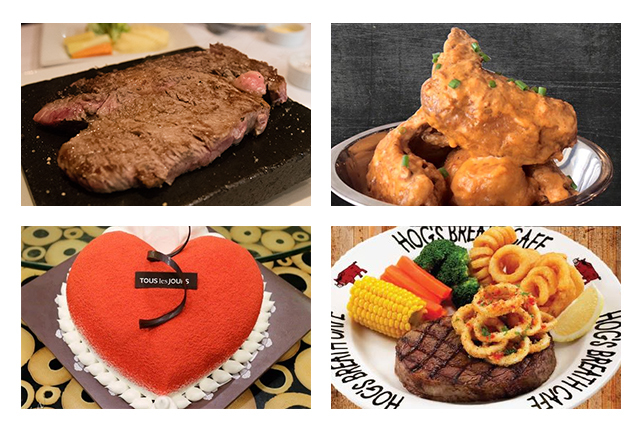 Order any steak at any branch and you get 40% off! This is until November 30. 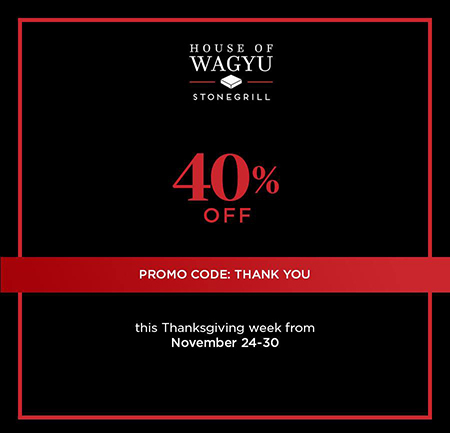 Read more about House of Wagyu's Thanksgiving deal. 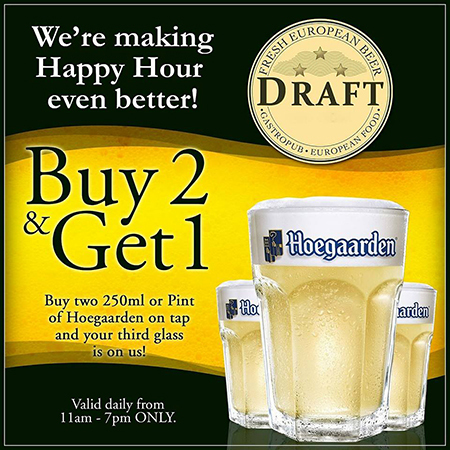 Buy two 250-mL or a pint of Hoegaarden on tap and you get a third glass on the house! This deal is valid only during Happy Hour—11 a.m. to 7 p.m.
Click here for a list of Draft branches. Looking for a quick gift to give this Christmas? 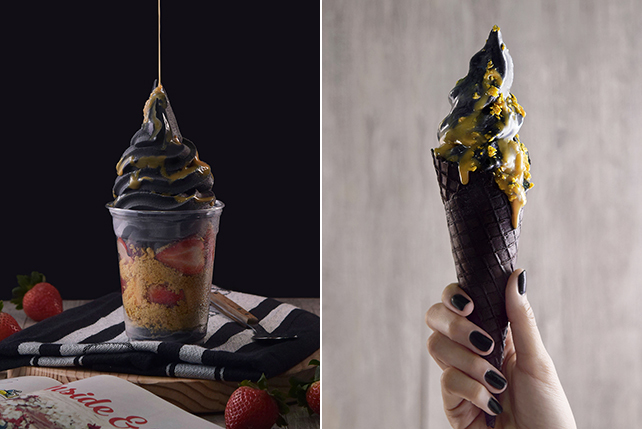 How about the most scrumptious Japanese cheesecakes? Book your orders at Green Cheese before December 6. 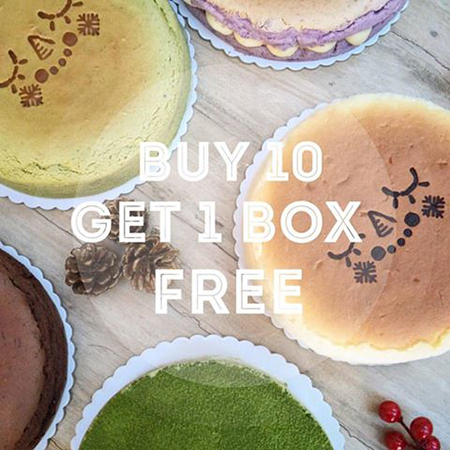 Order 10 and you get a free 11th cake (maybe a gift for yourself?). For orders, contact 0917-891-9595. Green Cheese is at Hole in the Wall, Century City Mall, Makati City. 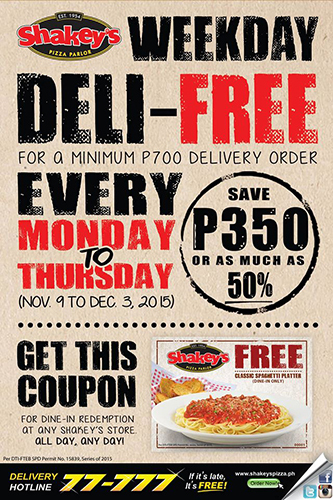 A minimum delivery order of P700 gets you a free Spaghetti Platter coupon that you can claim at any Shakey's branch (unfortunately and ironically, it's not redeemable via delivery). The promo, which saves you P350, is valid until December 3, Monday to Thursday only. Smokin' Pig is celebrating their second birthday with two-weeklong discounts. Until December 5, their solo plate with two cups of Cajun Dirty Rice and Brew Kettle is just P298. The Half Rack is just P498 while the Full Rack is P888. That's almost 45% in discounts. 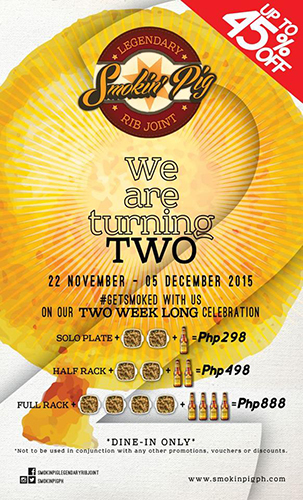 Smokin' Pig Legendary Rib Joint is at UG/F Capitol GreenStreet, Capitol Hills Drive, Quezon City. 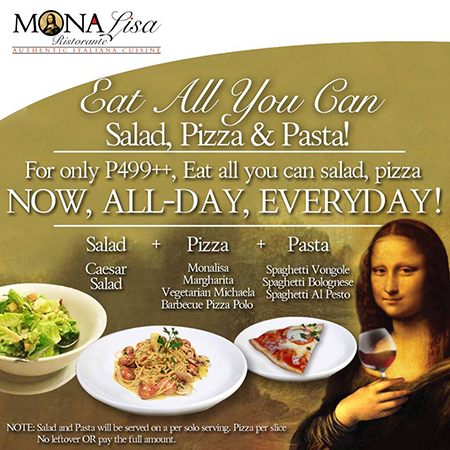 For only P499+ per head, you can have your fill of salads (Caesar), pizza (Monalisa, Margherita, Vegetarian Michaela, Barbecue Pizza Polo), and Pasta (Vongole, Bolognese, Al Pesto) every day, all day for the rest of 2015 at Mona Lisa. Note that the pizza and pasta will be served in solo portions. Read more about Mona Lisa's unlimited deal. Are you a Patisserie Connoisseur member? If you are, you can get a 15% discount on the following cakes: Strawberry Berry Cheesecake, Blueberry Berry Cheesecake, Tiramisu, Strawberry Inspiration Fresh Cream Cake, Love Inspiration Fresh Cream Cake, and Apple Inspiration Fresh Cream Cake. This deal is available until November 30. 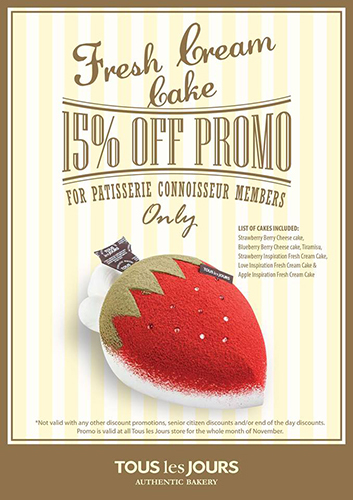 Click here for a list of Tous Les Jours branches. 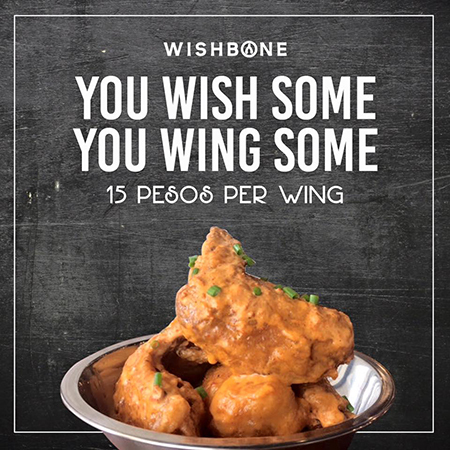 Wishbone's quirky wings fetch for about P35 apiece, but not today—up to November 30. During this time, 11:30 a.m. to 3 p.m. and 6 p.m. to 10 p.m., you can get their wings for P15 each. Choose from flavors like Chef Curry, Hickory, Teriyaki, Luchadore, Peppamansi, and Salted Egg. 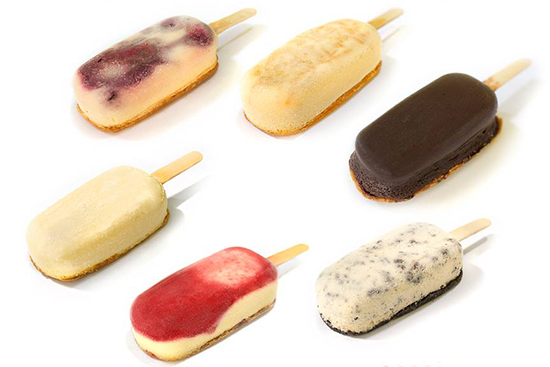 A minimum of six pieces is required per flavor and order. If you order eight pieces, you get free iced tea and rice. Read more about Wishbone's wing deal. Wishbone is at 56B East Capitol Drive, Kapitolyo, Pasig City. Good news! 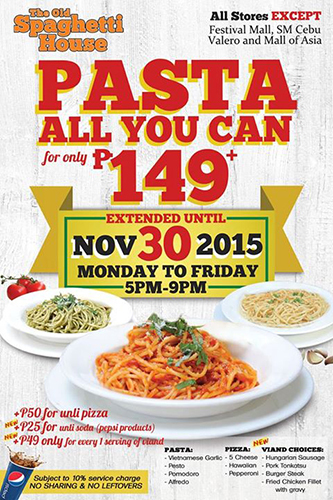 TOSH has once again extended their P149 unlimited pasta deal to November 30. It's avalable weekdays, from 5 p.m. to 9 p.m. at any branch except Festival Mall, Muntinlupa City and SM Mall of Asia, Pasay City.